Don and I love to sit outside, listen to the birds, watch the squirrels play, and enjoy what God has placed around us. It’s peaceful to just “be” in nature. A few days ago we were watching as a bird was flying in and out of one of the ferns in our front yard. She was a small bird, smaller than a sparrow. But back and forth she went, from one fern to the other, checking to see where her nest would be best placed. Now I don’t know what the construction criteria is for building a nest. I would imagine it would have something to do with levelness, maybe to do with height since they’re susceptible to predators, and possibly something to do with being out of the wind. But that tiny bird, with a brain smaller than a dime knows. She also know what to gather to make her nest strong. 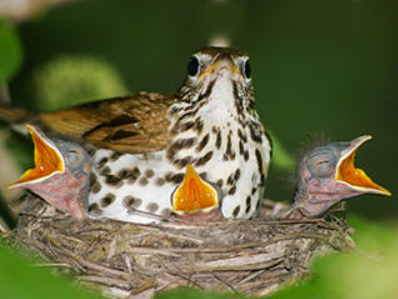 A bird nest can fall from a tree and still be intact. They use their beaks and feet to somehow weave together grass, leaves, branches, and all sorts of natural debris to make a nest sturdy enough to hold delicate eggs, and their young for up to three weeks. Squirrels have a different kind of wisdom. They will take every acorn in our yard (we have at least 6 large Oak Trees) and they will bury them in the front and back yard. In the spring when we go back outside after the cold winter, our yard is filled with small holes, just the size of an acorn, where they’ve returned and gathered their food for the day. Literally, there are thousands of them, and yes, I’m not a fan of the holes. But it intrigues me to think that a squirrel with a brain smaller than the acorn can remember all their hiding places, and dig them up. Some days I’m just a little jealous because I can’t find the simplest things in the set perimeter of my own home! A few days ago I came across this amazing video of a puffer fish creating an intricate design on the ocean floor sand. He worked tirelessly to create what is truly art with the greatest precision, and perfection that just spoke to my obsession for organization and perfection. But he was just a fish! A fish has a brain smaller than a dime. That same fish has only four teeth. They’re formed to make two bridges, upper and lower, that have the strength to crush seashells to and extract the mollusk that lives in them for food. Had they not been given that capability, as have some other fish as well, the entire oceanic eco system would be imbalanced. At my age, nature shows me age as well. The trees and the flowers coming back to life often resemble our own lives. We go through seasons of winter, when we don’t feel good, we don’t grow, we just become stagnant spiritually, emotionally, and yes even physically. But God doesn’t give up – He keeps reviving us. Matthew 10:30 says He even knows the number of hairs on our heads. That’s a lot of data! Consider the number of heads in this world, the number of new hairs that sprout each day, and the number that fall. I can safely say there is no computer in this world powerful enough for that kind of calculation! If I were in fact to try to make my one life’s goal to keep track of the number of hairs on my own head, there would be inaccuracies and imperfections to my numbers (which would probably make me lose the rest of my hairs to be honest!). In everything we see in Nature, God’s word tells us He is revealed. Romans 1:20 says “For ever since the world was created, people have seen the earth and sky. Through everything God made, they can clearly see his invisible qualities—his eternal power and divine nature. So they have no excuse for not knowing God.” The way to see the invisible God is to view His creation and learn about it. It’s not just that he thought about it and created remarkable plants and animals. Think deeper into WHY He did. In Genesis 1:26 God plans the creation of human beings. In His planning he states, “They will reign over the fish in the sea, the birds in the sky, the livestock, all the wild animals on the earth, and the small animals that scurry along the ground.” All we see in Nature is about God’s infinite love and care for us. Every bird created, every fish in the ocean, every plant, every breeze of air, every drop of water – all was created with us in mind. His love is as boundless as His wisdom. And for that reason, I have confidence that I don’t need to count the hairs on my head, worry about my nest, or my next meal. In fact, I don’t have to worry about anything. God has taken extremely good care of this human being and proven His love for me – and for you! Today let us rest in the assurance that He loves us beyond our own meager understanding, and has everything in the universe under His infinite control. He is God, and there is on other.